First, wild or naturally spawning stocks or runs of fall-run Chinook salmon in Valley rivers are all dominated by hatchery salmon. 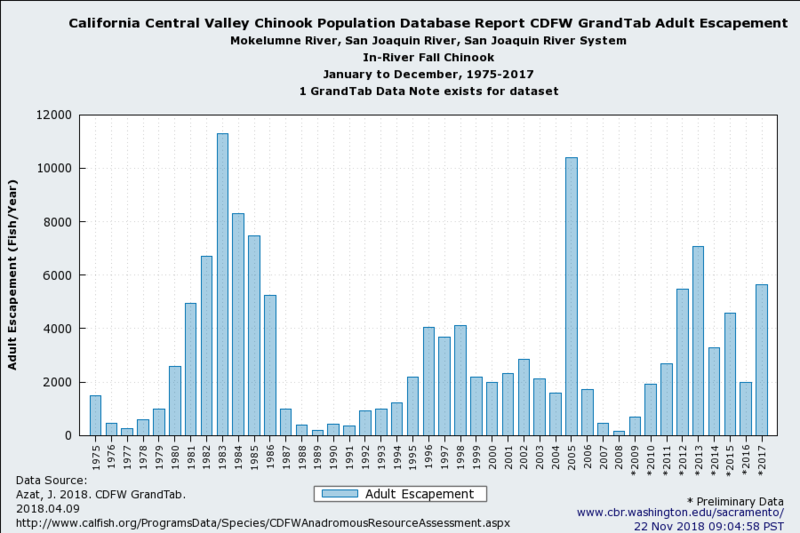 Without hatcheries and straying of hatchery salmon to non-hatchery rivers (e.g., Yuba, Cosumnes, etc. ), there would be almost no salmon runs of significance. Second, there are hardly any significant locally adapted (wild) traits left to erode. River flows, water temperatures, gravel spawning beds, large woody debris, predators, and channel morphologies have become so limiting or compromising that wild salmon survival is nearly nonexistent. Third, the “lifetime reproductive success” potential of wild fish is primarily compromised by water and fisheries management. 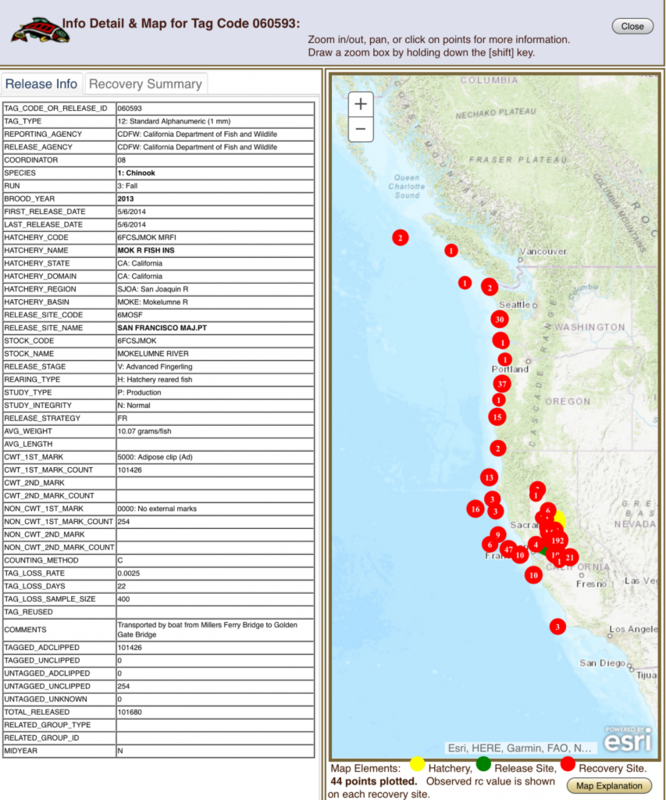 Flows are too low, and fisheries continue harvesting much of the wild salmon production. Fourth, the recent salmon population crashes of 2009 and 2016 are blamed by many salmon scientists on poor ocean conditions, with little regard for poor river habitat or water management as contributing factors, let alone hatcheries. By contrast, the federal Battle Creek hatchery managers knew they had to truck some of their smolt production to the Bay during the drought because of poor river conditions if they hoped for some survival and contribution to future runs. The authors of the paper imply that hatcheries are the problem. No doubt the hatchery programs could be improved to lessen their negative effects and improve their contribution to salmon recovery. But for sure the fault is not with the hatcheries. Lack of support for hatcheries by scientists and resource agencies will dry up hatchery funding by water-user entities and make the problem worse. The paper’s authors conclude: “There is a growing concern that salmon populations in the C[entral] V[alley] of California are becoming dependent upon hatchery supplementation, a conservation status recently identified as “mitigated extinction” Baumsteiger and Moyle 2017).” California salmon have been dependent on hatcheries for many decades. This is not a new development. Dams and diversions wiped out the wild salmon and their critical habitats, while hatcheries kept the dream going. Now scientists want to take the dream away. 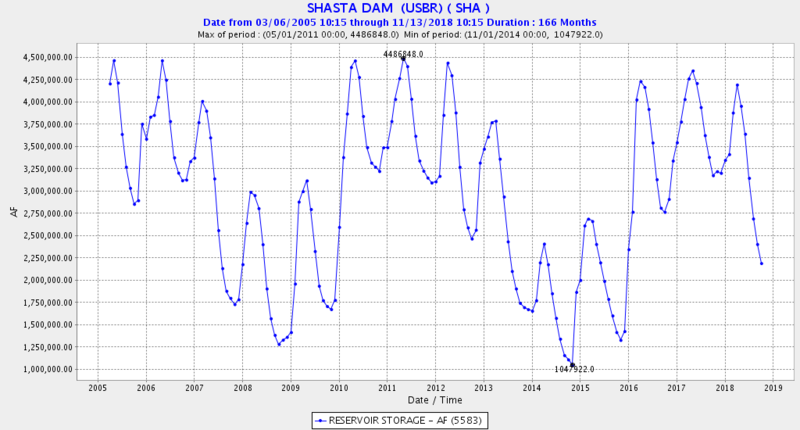 Despite nearly filling this past spring, Shasta Reservoir was drawn down over the summer and fall (Figures 4 and 5). The decline is unprecedented and is more typical of critical drought years. 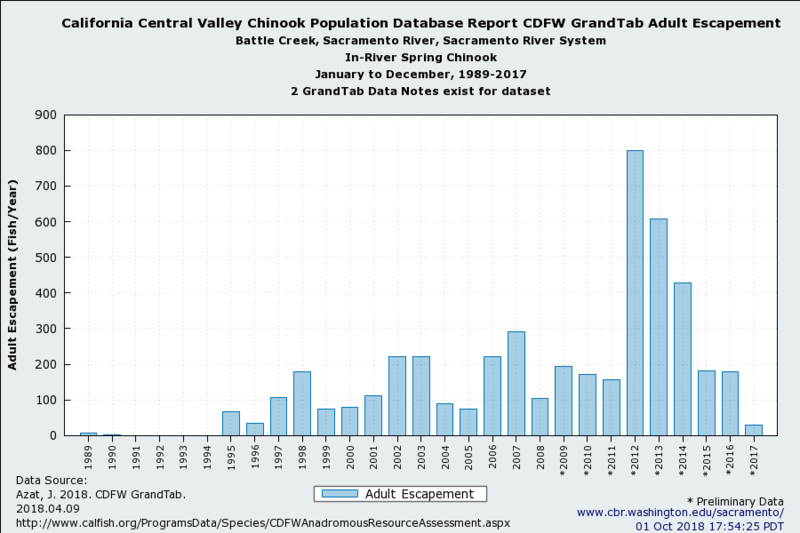 I recognize the concern for Shasta storage, but Reclamation’s decision to provide 100% water allocations under low snowpack conditions has again compromised Sacramento River salmon production. Figure 1. 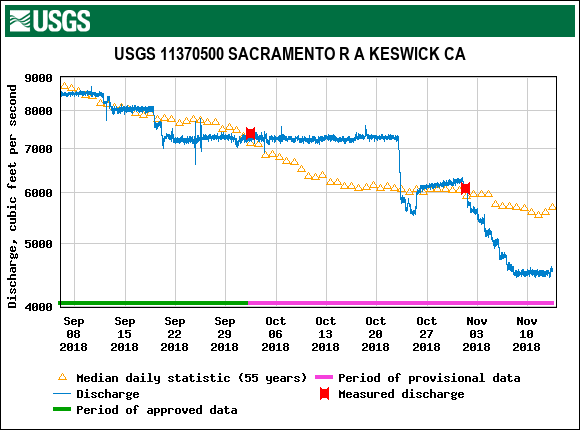 River flow (cfs) below Shasta/Keswick in the Sacramento River in fall 2018 along with long term average. Figure 2. 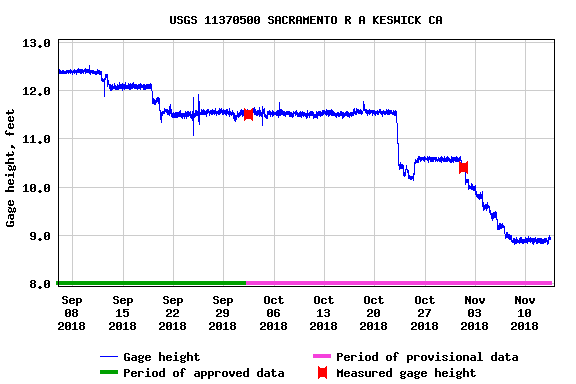 Water surface elevation in Sacramento River below Keswick Dam at upper end of prime salmon spawning reach in fall 2018. Figure 3. 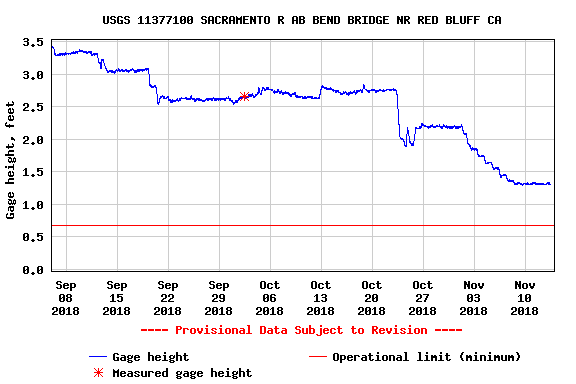 Water surface elevation in Sacramento River near Red Bluff at lower end of prime salmon spawning reach in fall 2018. Figure 4. 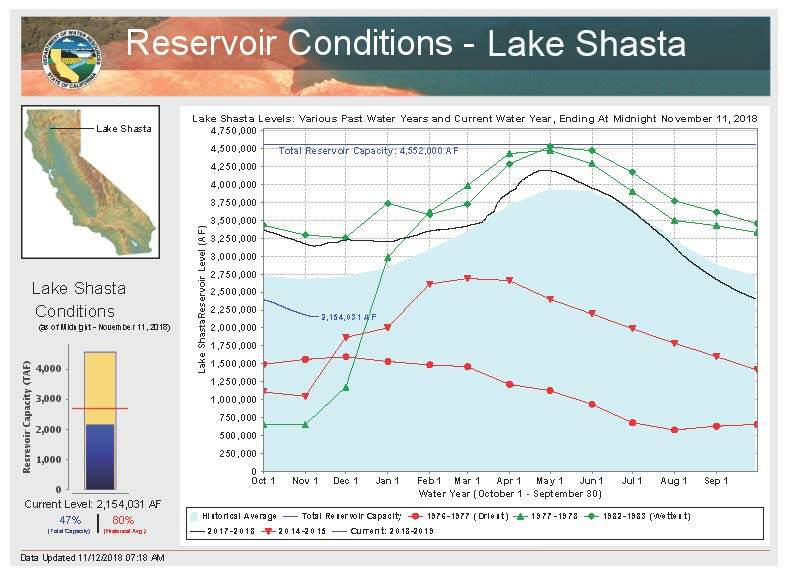 Shasta Reservoir information in 2018. Figure 5. Monthly Shasta reservoir storage 2005-2018. 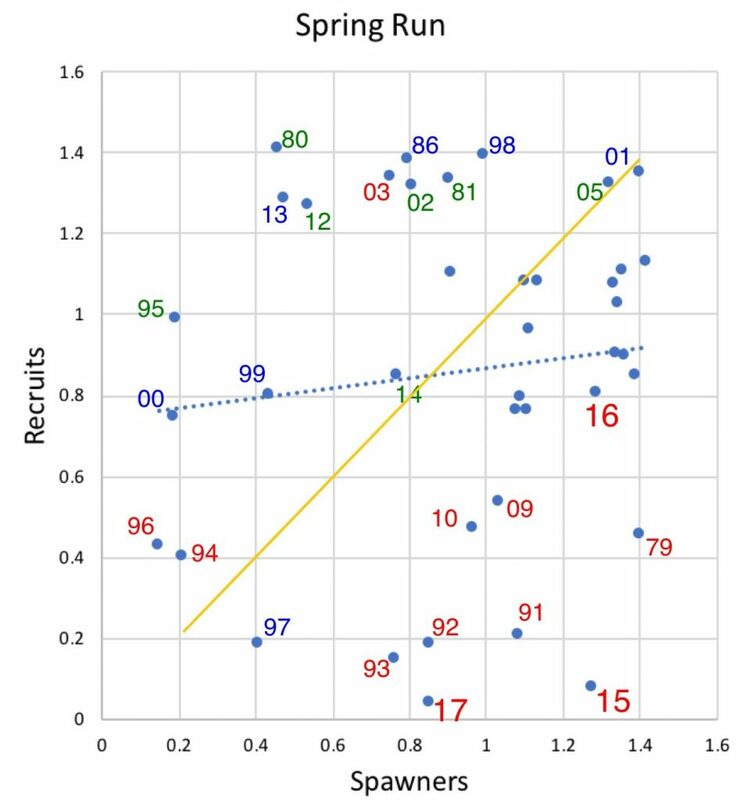 I plotted these numbers in a spawner-recruit relationship, with spawners being recruits three years earlier (Figure 2). The water year type during the first winter-spring following spawning is shown in Figure 2 by color. Winter-spring conditions reflect early rearing and emigration conditions in spawning rivers, as well as conditions in rivers downstream an in the Bay-Delta. Factors contributing to poor recruitment in the eight critically dry years in the observed period include low river flows, high water temperatures, excessive predation, loss at water diversions, and low turbidity, all factors that are inter-related. Poor ocean conditions and hatchery operations also were likely factors, which may also be related directly or indirectly to river flows. Most recent recovery efforts and planning have focused on habitat restoration.2 My own focus has been on poor river conditions (low flows and high water temperatures) and related predation.3 My reasoning is based on escapement trends over the past decade that indicate sharply dropping escapement during dry year low-flow conditions in most of the spawning rivers (Figures 3-5). Figure 1. 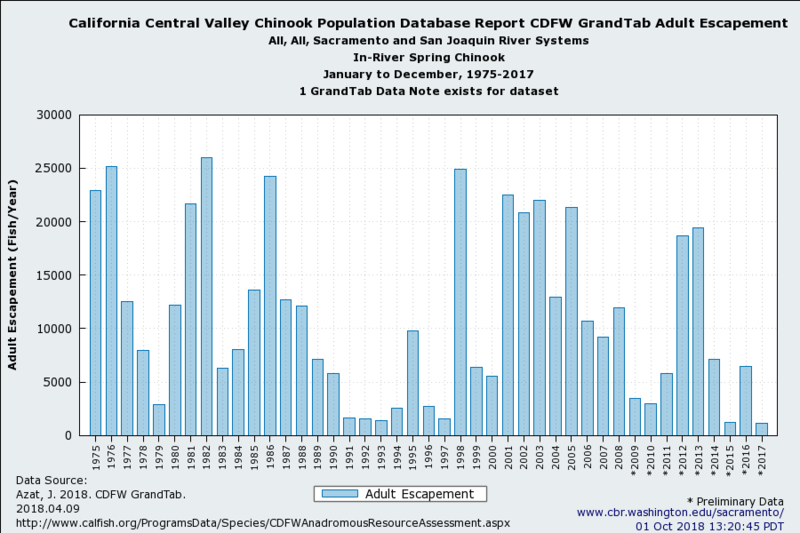 Spring run salmon in-river escapement (spawning run size) in the Central Valley from 1975 to 2017. Figure 2. Spawner-recruit relationship for Central Valley river escapement of spring-run Chinook salmon. Recruits represent spawner escapement for that year. Spawners are recruits from three years prior. Numbers are log10 of escapement minus three. Red represents dry years during winter-spring after fall spawn. Blue represents wet years. Green represents normal years. Blue dotted line is statistical trend line. Yellow line is replacement level. Note eight points in bottom-right quadrant represent winter-springs of critically dry drought years (77, 89-91, 07-08, 13, and 15). Figure 3. 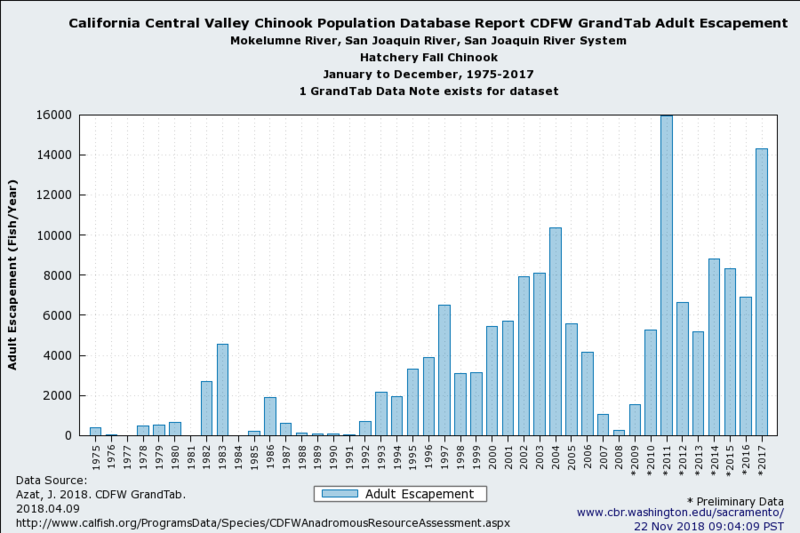 Battle Creek spring run salmon escapement from 1989 to 2017. Figure 4. 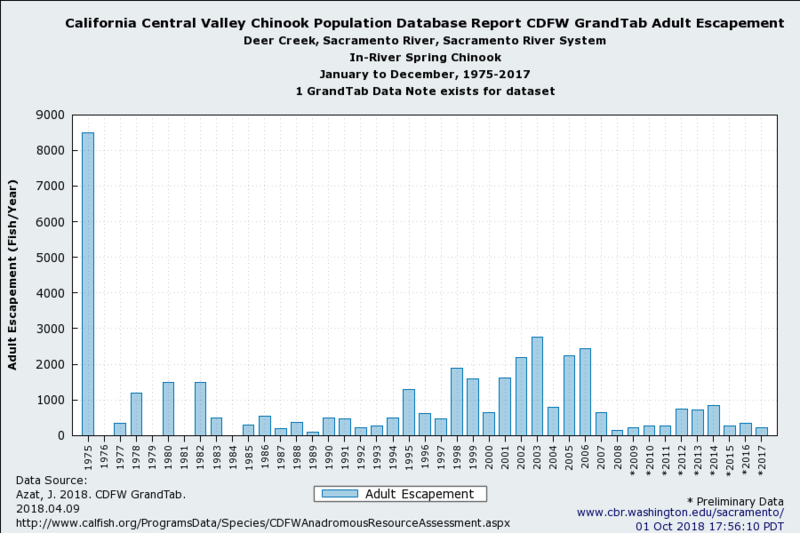 Deer Creek spring run salmon escapement from 1975 to 2017. Figure 5. 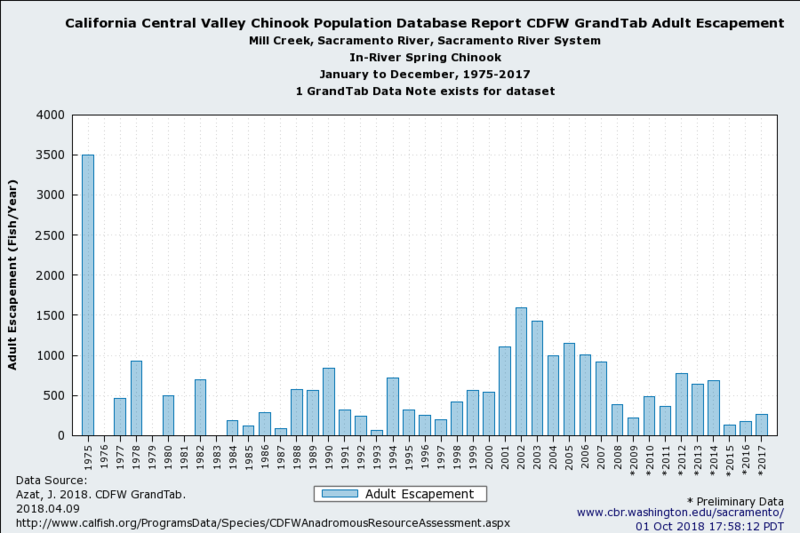 Mill Creek spring run salmon escapement from 1975 to 2017. One wonders whether trucking and barging millions of smolts reared at the Feather and American River hatcheries would lead to more salmon commercial and sport fishery catches and improved spawning runs in the Feather and American rivers, especially during droughts. Salmon run collapses during the 2007-2009 and 2013-2015 droughts were often blamed on poor ocean conditions, as well as poor river conditions. Concerns of potential straying are unfounded, as all the Bay releases of Feather and American hatcheries have low straying rates (see Figure 1 for example). Do we want a better return on our Central Valley salmon hatchery investments?